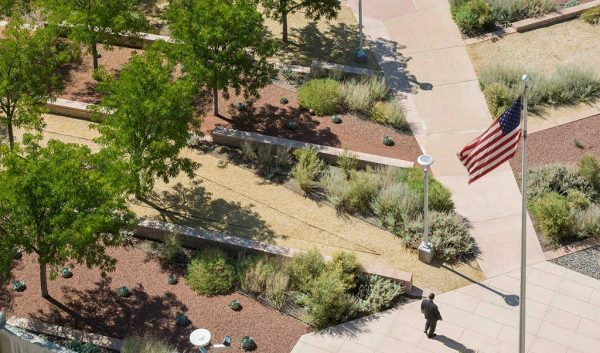 Originally created at the heart of New Spain in the 1700s, Main Plaza, or Plaza De Las Islas as it was known, was born as a civic center surrounding the Cathedral that synchronized the lives of these closely connected inhabitants. The plaza was the heart of a city that was quite literally planned and organized around it, as it bore witness to the many diverse rituals of the crowds who gathered there. As San Antonio grew, the plaza shrank physically, but not symbolically. 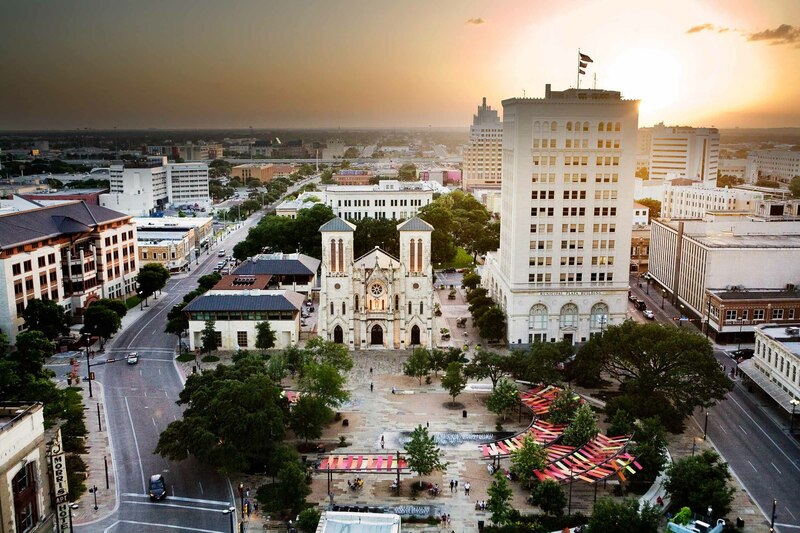 The plaza remained a vibrant part of the city fabric, deeply shaded with old-growth trees, framed by the 275-year old San Fernando Cathedral to the west, the historic City Courthouse to the south, and connected via a pedestrian portal to the famous San Antonio Riverwalk. 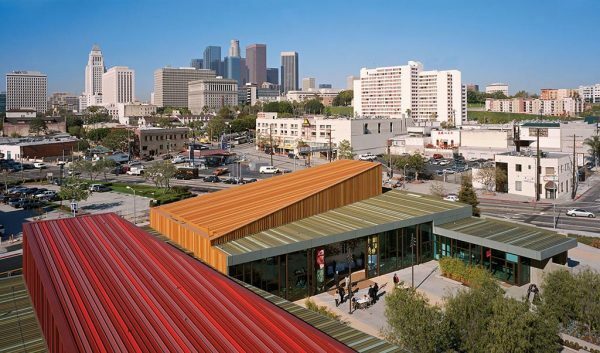 When a previous construction effort left old-growth red oak trees damaged and dead, Main Plaza Conservancy engaged Rios Clementi Hale Studios to design several canopies that would provide shade while young trees established and grew in. 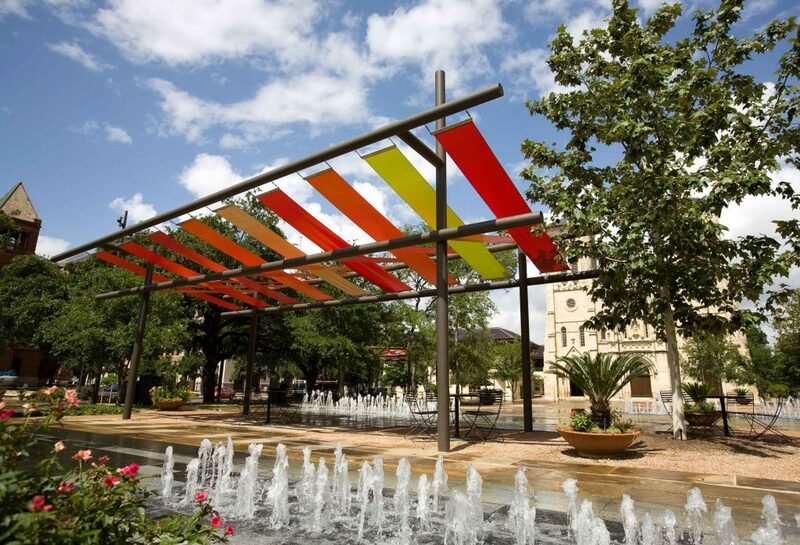 The canopy design needed to reflect San Antonio’s colorful cultural history as well as evoke the rich artisan tradition of the city while not impeding the crucial view of the Cathedral from the Riverwalk portal. 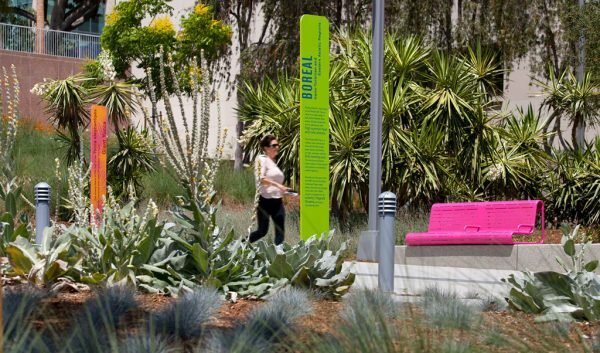 Additional challenges presented themselves as the project unfolded: the site is riddled with infrastructure servicing the park amenities, including five water features, and there are several archeological remains in the area that needed to be protected and avoided. 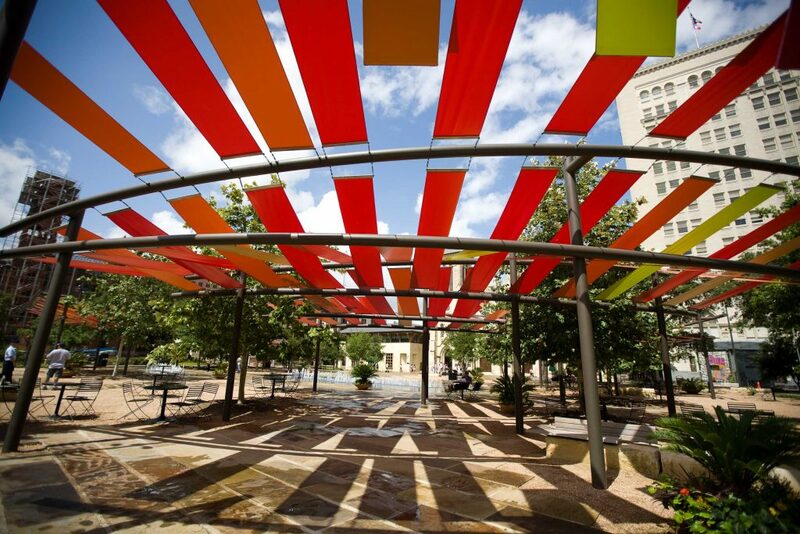 The design for the shade canopies takes inspiration from San Antonio’s handmade tradition and multi-cultural and ethnic history. A modern twist on a woven loom married to the bi-partite form of the historic trellises and archways guides their shape. 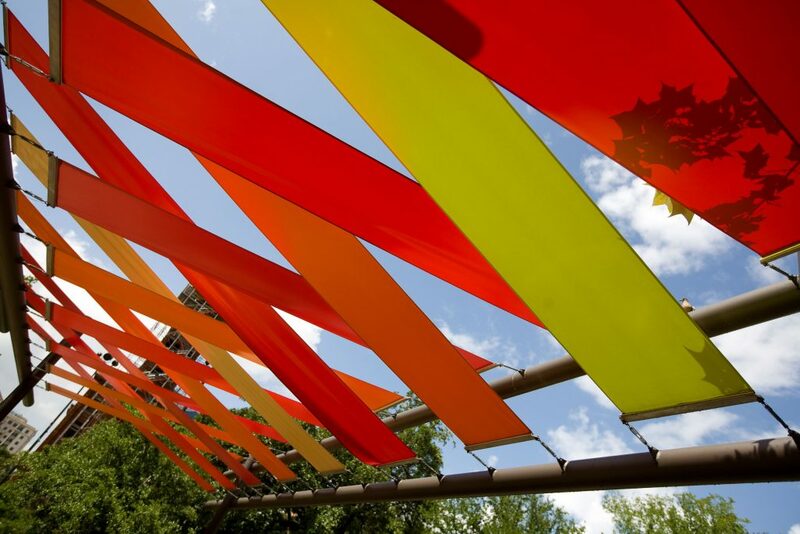 Each canopy creates a shaded area that averages 800 square feet through the use of colorful fabric bands weaving together overhead in an array of sculptural forms. 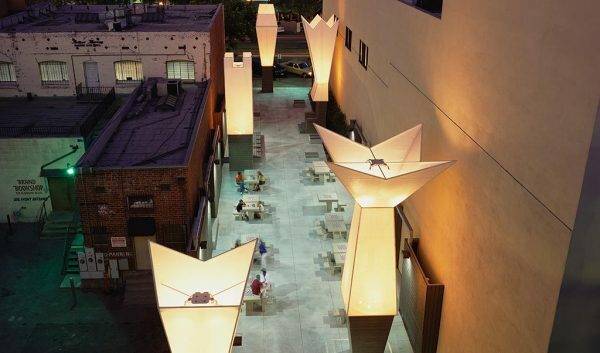 The canopies provide temporal visual interest that shifts depending on the location of the viewer as well as beautiful shadow patterns that alter with the location of the sun throughout the day. 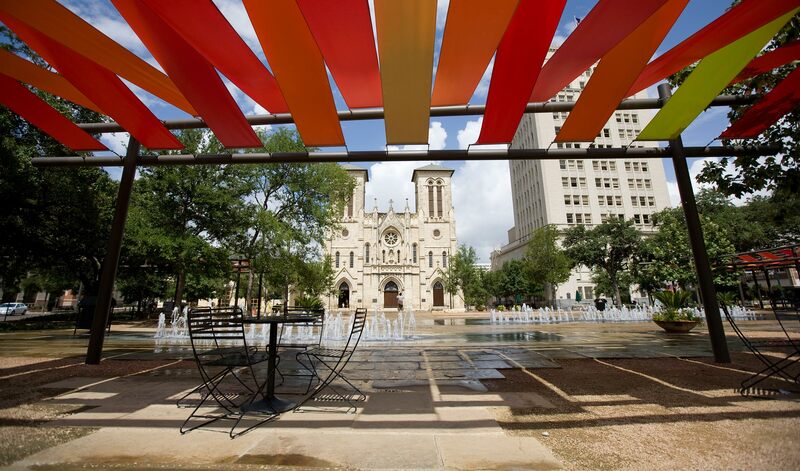 The Main Plaza landscape renovation was completed in 2007 and is now a heavily programmed public space in the heart of the City of San Antonio. 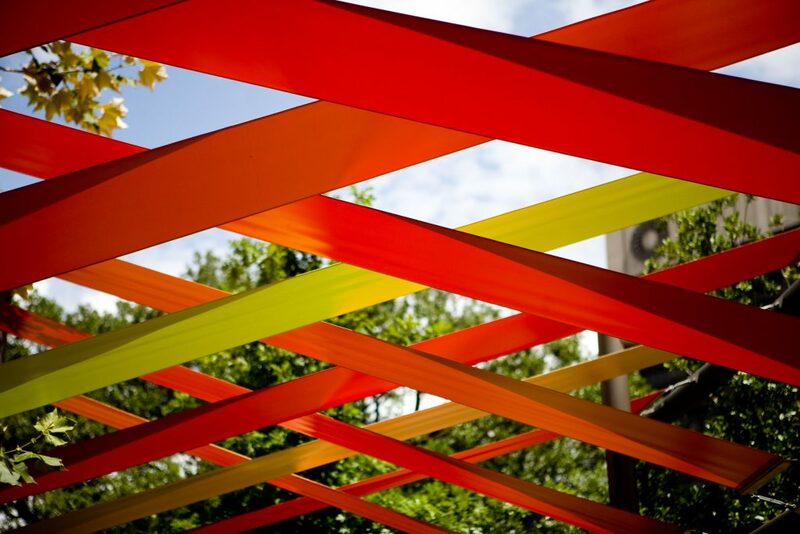 Though new trees continue to mature, these vibrant canopies are now interwoven with the rich history of this place and a part of its modern identity.